Ordering a martini at the bar can be an empowering, sophisticated feeling. Being able to channel your inner James Bond and order your choice of this timeless cocktail “shaken, not stirred” feels very fancy, but you could run the risk of your bartender rolling their eyes and dismissing you with a tut as it becomes clear you know more about quoting Bond movies than you do about what actually goes into making a martini. From the liquor involved to the manner in which your drink is served and garnished, there is a lot that can change from martini to martini. That is why it is important to know what you want to order, and how you would like it mixed, served, and garnished ahead of arriving at the bar. This will save your time, your bartender’s time, and your fellow patrons’. If the hustle and bustle of a busy cocktail bar isn’t quite your scene, it doesn’t mean you can’t enjoy a fancy martini; you can learn to easily and professionally make one in the comfort of your own home! Fix’s guide to martinis provides four simple, classic recipes for martinis that have stood the test of time. 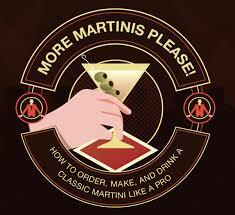 Impress your friends and family by serving some bar-quality martinis at your next social event. Whether it’s at home, at the bar, or while taking a break from your duties as a British secret agent, learning how to order, create, and drink a martini is an essential skill for those looking to add a little class to their next libation! Check out the fabulous infographic!